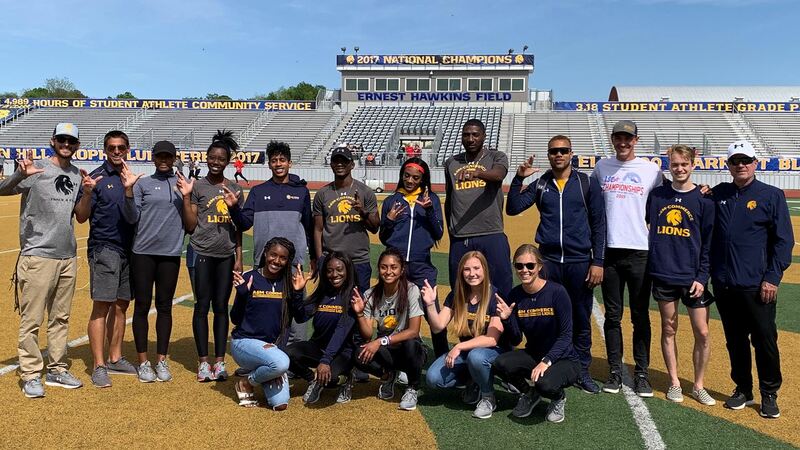 COMMERCE – The Texas A&M University-Commerce’s track and field teams broke four school records and picked up 16 event wins, as both the men’s and women’s teams earned team championships at the East Texas Invitational on Friday. The Lion men earned 205 points to defeat Tarleton by 93.5 points, and the Lion women scored 199 points to surpass Tarleton by 29 points. The most impressive mark of the meet came in the men’s discus, where Josh Boateng (St. George’s, Grenada) broke a 36-year old school record and Grenadian national record in the discus throw with a toss of 60.77m (199-4). That throw is the sixth-longest in Division II history. Boateng also won the discus throw with a mark of 17.52m (57-5 ¾). Eboni Coby (Lancaster) broke a six-year-old record in the women’s 200-meter dash, winning the event and earning a provisional qualifying time at 24.26 seconds. Markaaisha Richardson (Amarillo – Tascosa) broke the school record in the women’s 100-meter hurdles and earned a provisional qualifying mark at 14.03 seconds. Tamara Susa (Novi Sad, Serbia) broke a school record which stood since 2009 in the women’s javelin throw at 45.50m (149-3), also earning a provisional qualifying mark. She also won the women’s discus throw at 42.95m (140-11). Rashard Clark (Los Angeles, Calif.) improved his provisional qualifying time in the 200-meter dash at 21.09 seconds, and Dorian Andrews (Dallas – Skyline) earned a provisional qualifying time in the 110-meter hurdles at 14.41 seconds. Robert Wood (Wylie) won both the men’s high jump and javelin throw. Mackenzie Clark (Garland – Naaman Forest) won the women’s 100-meter dash and was on the champion 4×100 meter relay with Richardson, Ro’Nisha Simpson (Tatum), and Coby. Talia Lujua (Getxo, Spain) won the women’s triple jump, and Hudson Hall (Gregory-Portland) won the men’s pole vault. The Lions return to action with split-squad action next weekend, splitting the groups between the Mt. SAC Relays in Southern California and the LSU Alumni Gold in Baton Rouge, La. No. 8 Lions sweep the day, take the series against No. 21 Tarleton. STEPHENVILLE– The No. 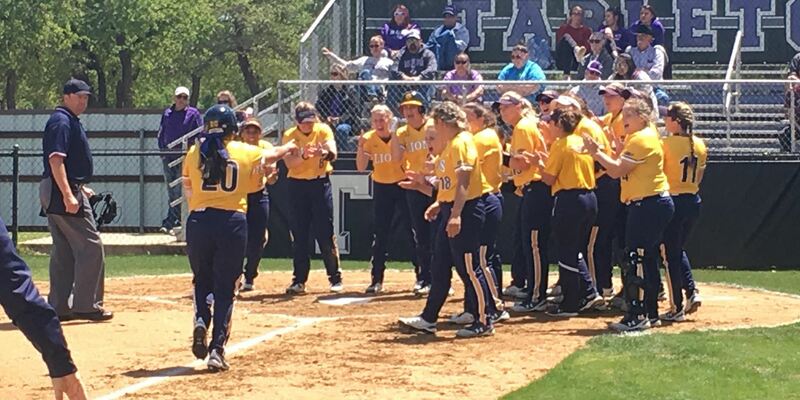 8 Texas A&M University-Commerce softball team earned two wins over No. 21 Tarleton on Friday afternoon. The Lions won the first game 8-0 and the second game 8-4. The wins bring the Lions to 35-10 on the season and 21-6 in the Lone Star Conference. Tarleton falls to 31-11 and 15-9 in conference play. The Lions return to action on Wednesday for a non-conference doubleheader against St. Edward’s. The first game will start at 1 p.m. at Diane Daniels Field in Austin. – Katie Dean (Whitesboro) pitched a complete game, giving up just two hits while striking out four. – Chealsea Slider (Texarkana – Texas HS) hit a three-run homer in the fourth inning. – Madison Schaefer (Frisco – Independence) hit a two-run homer in the third inning. – Vanessa Muro (Oak Hills, Calif.) hit a solo homer in the second inning. Kayla Kilcrease (Kerens) also had a two-RBI single. – Kimber Neal (Humble – Atascocita) had two hits and scored twice. Jodie Hill (Heavener, Okla.), Vanessa Avina (Haltom City) and Ta’Lyn Moody (Mansfield – Legacy) also scored. Dean struck the first two batters she faced as neither team put a run on the board in the first inning. The Lions then struck first, with Muro hitting a solo homer into right. The Lions turned a double play in the bottom half and led 1-0 after two complete. The Lions added two runs in the third inning. Neal doubled and scored on a home run from Schaefer. Dean struck out two more in the bottom half, and the Lions led 3-0 after three. The Lions blew the game open in the fourth, scoring five runs. Slider hit a three-run homer to double the Lion lead. With Hill and Neal in scoring position, Kilcrease hit a ball through the middle to score both. The Lions led 8-0 after four. TSU had two runners reach in the bottom of the inning, but Dean forced a groundout on the final play to end the game. – Kimber Neal hit a three-run homer to give the Lions the lead for good. She also walked in a run. – Vanessa Muro also hit a home run. – Kinsie Hebler (Cypress – Cy Fair) had three hits and drove in a run. – Kayla Kilcrease and Chealsea Slider both had two hits, and each scored a run. – Avery Boley (Fort Worth – Nolan Catholic) had a single and drove in two runs. Jodie Hill also had a single and scored twice. – Emily Otto (Richmond – Lamar Consolidated) pitched the final 4.2 innings and earned the win. She had six strikeouts. Katie Dean pitched the first 2.1 innings. Both teams had a pair of players reach in the first, but neither could bring in a run. The Lions then took the lead on the first pitch of the second inning. Muro squared her bat and blasted a ball over the left field fence. The Lions led 1-0 after two complete. A&M-Commerce added to its lead in the third. Kilcrease hit a double and Hebler hit a single. Boley then flew out to the left, bringing in Kilcrease on the sacrifice. TSU answered back with a pair of runs in the bottom of the inning. After three, the teams were tied at two. The Lions regained the lead in the fourth. Slider and Hill both singled. Neal then hit a bomb over the center field fence. The Lions weren’t done there. Schaefer walked, and Hebler singled. Boley then singled up the middle to score Schaefer. Otto entered in relief and struck out a batter in the bottom of the inning. The Lions led 6-2 after four complete. The Lions added two runs in the fifth inning. An error and three walks brought in a runner as Neal pushed the run across. Hebler then hit through the left side to bring in another. TSU hit a home run in the bottom of the inning, and the Lions led 8-4. Otto retired six of the final seven batters she faced, including a swinging strikeout to seal the win.